Executive functions comprise a broad set of metal processes providing us with the possibility of handling situations outside of learned, automated schemata. While the prefrontal cortex (in particular the DLPFC) has received most attention as the neuronal substrate for executive functions, it has become increasingly obvious that these processes are also sustained by many regions outside of this structure forming distributed but closely interacting networks. In addition, performance in tasks probing executive functions shows a high inter-individual variability with lower performance being consistently reported in many clinical conditions. This talk will focus on disturbances of brain regions of the executive system and their connections in patients with schizophrenia. Several aspects will be particularly highlighted in this context. First, the potential for comparative studies both across networks and disorders to differentiate specific impairments from global vulnerability. Second the importance of considering multiple aspects of brain organization and relating them to behavior. Last, the need for a more precise regional allocation of regional effects as currently prevalent by macroanatomical labels. Simon Eickhoff studied medicine in Aachen, Sheffield, Sydney and London. He received his doctorate degree in neuroanatomy in 2006, following work on brain histology and structure-function correlations at the Heinrich-Heine University in Düsseldorf. He went on to work as a post-doctoral fellow in functional neuroanatomy at the Research Center Jülich, Germany before being appointed as assistant professor for Psychiatry at the RWTH Aachen in 2009. Here his work centered on functional MRI and network analysis. 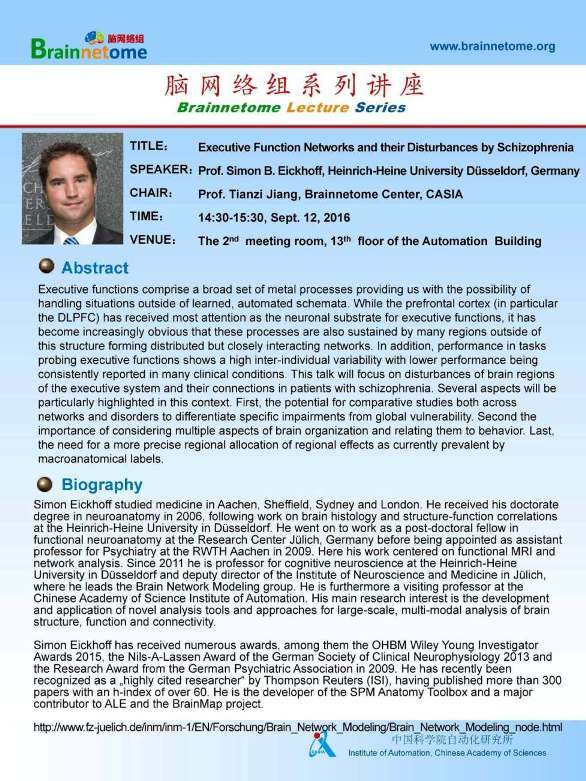 Since 2011 he is professor for cognitive neuroscience at the Heinrich-Heine University in Düsseldorf and deputy director of the Institute of Neuroscience and Medicine in Jülich, where he leads the Brain Network Modeling group. He is furthermore a visiting professor at the Chinese Academy of Science Institute of Automation. His main research interest is the development and application of novel analysis tools and approaches for large-scale, multi-modal analysis of brain structure, function and connectivity. Simon Eickhoff has received numerous awards, among them the OHBM Wiley Young Investigator Awards 2015, the Nils-A-Lassen Award of the German Society of Clinical Neurophysiology 2013 and the Research Award from the German Psychiatric Association in 2009. He has recently been recognized as a „highly cited researcher" by Thompson Reuters (ISI), having published more than 300 papers with an h-index of over 60. He is the developer of the SPM Anatomy Toolbox and a major contributor to ALE and the BrainMap project.